Maidstone – a hot bed of legal jobs? Maidstone Town Centre looking very picturesque. Its not just made of stone. Despite rumours that have circulated around the world for the last one hundred years or so, the Kent town of Maidstone is not entirely made out of stone. This has disappointed millions of tourists who excitedly travel to the fabled region each year only to discover that Maidstone is mostly constructed from a range of fairly conventional building materials, including, cement, brick,steel, wood and plastic. My own personal memory of a visit to Maidstone was the hunt for a supermarket to have lunch at on the way to the Channel Tunnel. It seemed a very busy town with serious traffic issues, a poor 3G signal (although that may have changed now) and an annoying lack of supermarket restaurants! Nonetheless, the town does enjoy a well- deserved reputation as one of the most picturesque county towns in Central Kent and has a fascinating history, playing a significant role in Roman Britain, the Saxon period and the English Civil War. In present day, Maidstone is arguably best known (in Maidstone) as being the media centre of Kent, with a radio and television station that broadcast from facilities in the town centre known as the Maidstone Studios. The town features three locally renowned and architecturally distinctive theatres, the Hazlitt Theatre, River Stage, The Exchange Theatre and the Hermitage Millennium Amphitheatre which each showcase a hugely varied range of plays and often acclaimed productions throughout the year. Maidstone is also enshrined in folklore for James Bond fans as the town is referenced several times in Ian Fleming’s novel, “ Moonraker”, whilst the equally iconic British author, Jack London sets part of his celebrated 1903 novel, “ The People of the Abyss” in the town. Maidstone also offers a range of impressive museums and galleries, including Kent Life, which features a permanent display documenting the history of the area and The Museum and Art Gallery which hosts an outstanding collection of geological, art, ethnographic and biological artefacts and objects. Is there anything to do in Maidstone? Maidstone and the River Medway. Maidstone has a well -deserved reputation for excellent shops, cafes, bars, bistros, restaurants, pubs, boutiques and markets. The centre of the town is small enough for shoppers to stroll around effortlessly and its main shopping areas include the High Street, Week Street, Fremlin Walk, The Mall Chequers and King Street. The town is separated by the river Medway and on the other side of the water; Maidstone also hosts the delightful rustic ambience of St Peter’s Wharf, which contains an enviable collection of distinctive craft, arts, homewares and vintage clothes stores. 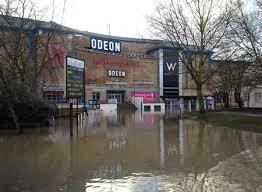 Flooding in Maidstone – going to the cinema by boat. Sometimes you don’t need to cross the River Medway using a bridge – it helpfully floods from time to time allowing instant access from all sides by boat. As you’d expect from a town in the middle of a key agricultural region, Maidstone is also home to regular farmers markets which source some of the finest organic produce from this area of Kent and beyond. Maidstone is an interesting town which combines both the traditional and the contemporary. Historic coaching inns and cobbled streets rub shoulders with modern office buildings and tower clocks, creating a fascinating clash of the past and the present. It is easily accessible to London with twice hourly trains running into London St Pancras and Victoria, and can be reached by car on the M20 which also connects to Ashford and Folkestone. 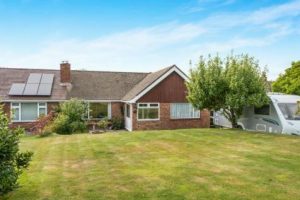 This 3 bed bungalow was up for sale in 2016 for £450,000. As always, the price of property is hugely varied, with flats costing between £75,000 and £180,000 and detached houses with market values between £200,000 and £850,000. It also boasts several schools which have been classified as, “outstanding” by Ofsted, including Allington, Valley Park Community and Maidstone Grammars for Girls and Boys. If you’re a sports enthusiast, there’s plenty to choose from. Maidstone United FC was formed in 1897 and continues to make impressive in roads into major competitions despite its current non –league status, whilst Maidstone Rugby Football Club, also founded in the late 19th century won the National RFU Intermediate Cup in the 2014-1015 season. The town is also well known for its water activities, and hosts a sailing and rowing club due to its close proximity to the winding banks of the River Medway.